In the meantime we had more visitors this week! With the departure of Bob and Deanne we had just hours to prepare for our next guests. Dino and Lisa had made the trek from Fergus Falls Minnesota to spend a few days with us. We also received a message that fellow fulltime RV’er and friend Richard was going to be in the area for a few days so he too joined us filling the J Bar B to capacity. We had 4 days of visiting intermixed with work and adventures such as the hike mentioned in our last post. Since Dino and Lisa do not have solar, we were the ever accommodating hosts and moved our rig so they could plug in. We moved our rig onto our house pad and were happy to find that it will indeed fit into the area we had marked out for the garage. Richard found a somewhat level spot along the west fence line. 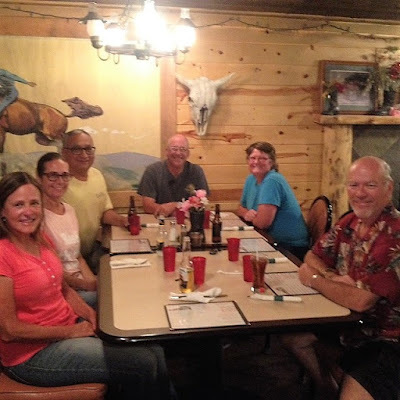 We got out to dinner at the Hitchrail in Pringle with the entire group as well as the Jordans. The gang out for dinner! And checked another brewery off our Black Hills Brewery Tour. We now have 4 down and 6 to go. The Highway 79 Brewery is located about 5 miles outside of Hot Springs and boasts that they have 31 taps (18 were active). They also have a pretty extensive food menu so you could plan a meal with your visit. With the bank thermometer in town reading 104, we were more interested in the beer! 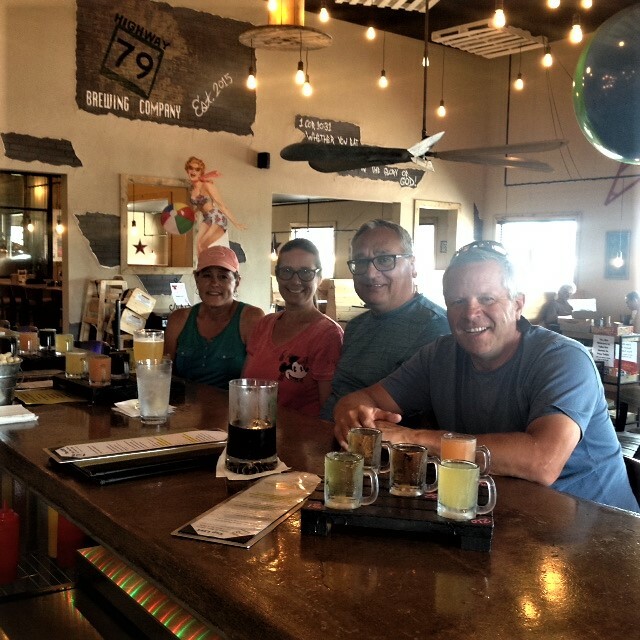 Barb, Lisa and I each got a flight while Dino opted for a pint of the Lemon Squeezie. Since it was so hot we pretty much tried their lighter, more refreshing varieties. My favorite was the Blood Orange Cider and the Highway 79 Beachball. Working on another goal, Barb talked Dino and Lisa into a bike ride along the Mickelson trail. Barb’s long term goal is to bike the entire 109 miles of the trail from Deadwood to Edgemont. Certainly not all in one day and preferably in a manner that is all downhill. So I dropped them off at the White Elephant Trailhead a few miles north of Pringle and they biked the 12 or so miles home. They returned an hour and a half later, Barb and Dino were whooped while Lisa looked like she was ready to go another 12 miles. Ready to bike the Michelson! 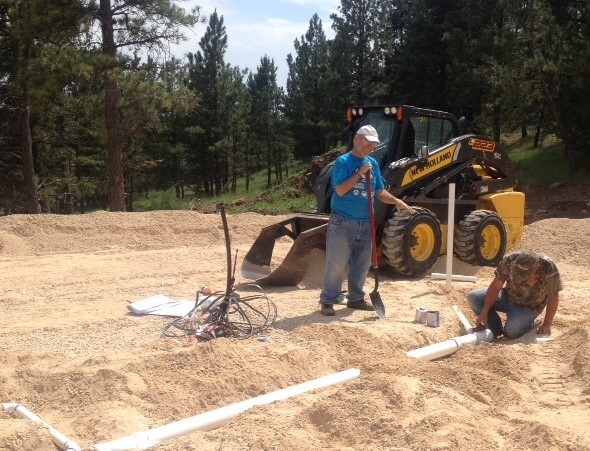 Meanwhile Richard and I spent several hours working on the plumbing on our build site. It was nice to have some help getting a good chunk of it done. We would have gotten more done but the 3+”’s of rain we received the past few days really put a damper on the progress. Richard and I doing some plumbing! I know many of you are wondering if I got my spotting scope last weekend for Father's Day. I ran to the mailbox each day and anxiously watched for the UPS truck all week to see if it would be delivered and finally a package came but it was way too small to be a spotting scope. I could not imagine what she bought me! Barb promptly took the camera from my hands and said "oh cool, my new camera is here". It was then I came to realize that it must be "opposite year" as Barb ordered me a new camera for Mother's Day and she ordered herself one for Father's Day. She got herself a SonyHX80. It is small and compact which is the key criteria she was looking for. So the wait continues for the spotting scope. Perhaps a Go Fund Me page is in order????? Kevin drove back out with 4 friends to try and get his concrete pad in. The plan was to do the final grade, get the foam laid and put in the in-floor heat then pour ½ of the pad the first day and then pour the second ½ the next day. Everything was going great, we were on schedule for a 2:00 pour Tuesday afternoon when it started raining and we were done for the day. The rain continued for two days while they were here but we managed to dodge the storms and get everything in and were just waiting for the rain to stop long enough to get the pour in. Foam down, in-floor heat down, ready for concrete! They had to stay an extra day but it finally stopped raining Thursday morning and the four trucks started rolling in about 10:00. 2 1/2 fast and furious hours later the concrete was down and the final touches were being up on. Thursday night we went out with Phil and Rudee who had a couple extra passes for a play at the Black Hills Playhouse located in Custer State Park, The play was called "The 25th Annual Putnam County Spelling Bee" and was hilarious! We ran into Vicki and Harry there as well who were taking advantage of the free passes as a perk from their job as well. Last but certainly not least, Dino must have taken offense to my last post detailing our Sunday Gulch hike and posted his own alternative version of the facts on his view of the hike and his visit here. I think the heat must have gotten to him as he certainly seems delusional…. You be the judge…..
Well, here it is. We check our trail cameras once a week to see what is on them and imagine our surprise when we found the first verified picture of a mating pair of Skunk Apes in South Dakota, I am just glad we did not catch them in the act! The sun hit the calm water acting like a mirror as it reflected the image of the granite pillars emerging from the depths of the lake. The laughter of children echoed as they played at the water’s edge. This was the scene at the trailhead of our first hike in the Black Hills this season. We were with good friends Dino and Lisa who made the 9 hour trek from northwest Minnesota to visit our little oasis. If Dino were to write the opening to this post it would go something like this…..
Day 2 of our so called “vacation”. All I have done so far is work! “Hey Dino, want to drive the skidsteer and level some prairie dog mounds?” Two hours of bouncing around later my arthritic hands and calcified arches are killing me! And what does Jim give me when I return? A warm beer! Now they want me to go on this 2.8 mile death march with screaming kids everywhere! Imagine what kind of bacteria there is in that water with all those screamers running around. But off we go dodging crying kids, bickering spouses and dogs that won’t shut up. Did I mention my calcified arches are killing me? I am not complaining, I am just saying… Down and down we go getting our feet soaked in these muddy patches of water. Don’t these people know what goes down must come up? How far down does this damn trail go? Jim is in the lead and keeps passing logs and stumps that are perfect for resting areas my feet. Did I mention they hurt? I have a medical condition, I am not complaining just thought you should know. We finally get to the bottom of the death march, now it is all up hill, but wait it looks like Jim and the girls are taking a break on the log ahead! Finally! As I catch up they stand up and start hiking again! What about my arches? They need to rest! Ugh, onward we go, one foot in front of the other… It will be fun they said, best hike in the hills they said…. What’s that up ahead? Stairs and handrails? You have got to be freaking kidding me, how are my arthritic hands supposed to grip those?!?! Well, that is how I envision Dino’s opening to this posts. I better stop with his interpretation before I lose too many readers. It seems like more of the hikers we saw were doing the trail counterclockwise but several of the reviews we read said to do it clockwise and we did not regret it. The trail was not too crowded and with most of the people going the other way, we only ran into ½ dozen people going our direction. The occasional tour helicopter would fly over as it took tourists on the area sights. The trail started out at Sylvan Lake whose large rock formations will just leave you in awe. We climbed and wound through several of these formations then started a 1.5 mile downward trek which provided great views of the surrounding countryside. Everyone was all smiles at the trailhead! Once at the bottom there is a hairpin turn which leads you back up the gulch. There are several stream crossings requiring you to cross on rocks or logs but if you are careful you can do it without getting your feet wet. We were all having a good time, Dino was quieter than usual and mentioned something about calcification but I was looking at the scenery and did not really catch what he was saying. The downside of going clockwise is that the last mile is at a pretty good uphill grade. But up we went like 4 little ants in a row. Everyone once in a while we would stop and wait for Dino to catch up as I was sure he did not want to hike alone. When he would catch up, off we would go again…. At one point I thought I heard Dino say something about a Death March but I am not sure. At another point, he must have seen someone he knew in one of the passing helicopters as he took off his shirt and was waving it yelling “I am over here!” Dino can be so silly sometimes. Soon we came to a series of rock and concrete stairs with handrails. How cool is that? The stream ran down beside many of the stairs and we were able to see some trout in the deeper pools. Up and up we went breathing in the fresh air and working our calves and looking at all the cool formations. Dino mentioned something about arches but I did not see any. Maybe he was talking about an arch he saw last year in Moab. Overall, it took us a little less than three hours and was a great hike. I would highly recommend for anyone in the area. What’s up for tomorrow? I see Dino and Lisa brought their bikes, maybe we will go for a bike ride! The roads throughout the Black Hills are filled with RV’s of all sizes exploring the area. This is our first tourist season in the area and we were warned that it was going to be crazy. All of the restaurants, shops and motels closed during the off season have been open since early May. With this influx of activity we have started to strategically time our visits to town. We have a secret travel route into town to avoid traffic, schedule our laundry times and there are a few restaurants that we avoid during peak season. But even with these precautions sometimes necessity requires you to dive into the middle of the tourist foray to see and do some of the activities you want to partake in. This is exactly what happened this week….. and it wasn’t too bad at all. Farmer Bob and Deanne arrived late Friday afternoon and stayed in a small rental cabin a few hundred yards from our rig. After planting 4,000+ acres in crops in the past few weeks they were ready for a well-deserved vacation. With their Polaris Ranger in tow, their 8+ hour drive from North Central North Dakota went without a hitch. Since they were only here 3 days we had a full schedule of activities planned. Day one’s agenda started out with an ATV ride on some of the many trails throughout the National Forest. We left right from our place and accessed the trails about a mile down the road. Most of the trails are well groom and signed so even the most novice explorers cannot get lost, or can they?????? Luckily we had maps and GPS's to guide us on our journey and we did not get lost at all. We wound through the forest valleys with great scenery but the great views came from the high vistas and lookouts. Our version of lunch with a view! After scratching the ATV itch we headed back home and jumped in the truck and were off to Hill City for a ride on the 1880 Train that runs from Hill City to Keystone and back. We had driven by these trains countless times in the past few years on our land search and now it was time to take a ride! They have both steam engine and diesel engine locomotives so depending on which one you want to ride you would schedule your day accordingly. We wanted the steam engine for the full 1880 experience! Barb went on line and made our reservations several days in advance. The seats are $29/person and you are able to pick the specific seat you want on both the outgoing and return trip. We sat on one side on the trip to Keystone and the opposite side on the return trip. There are both open air cars as well as cars with windows. Since it was such a nice day we opted for the open air. Be warned the steam engine whistle is very loud so you will not want to get a seat directly behind the engine. We were 3 cars behind the engine on our return trip and it was very loud! After arriving at Keystone we had a 15 minute layover while the locomotive repositioned itself to the back of the train for the return trip . Overall it was a great experience and is something we would not have normally done but glad we did! Day 2 started out overcast and foggy Bob and I spent some time tending to the prairie dogs and fencing before we started our tourist activities for the day. The turkey vultures were waiting for us to hit the fields! For our next adventure we were off to Jewel Cave for their Scenic Tour. Again Barb reserved our $12/person tickets in advance as many of the tours are filled before you get there. This makes the fourth different cave tour we have been on. Carlsbad Caverns is still at the top of our list followed by Kartchner Caverns due to the variety and size of features in each. But if you are in this area I would definitely recommend both Jewel and Wind Cave tours. Even though they are only miles apart Wind Cave and Jewel are vastly different. Where Wind Cave has mainly box and popcorn formations, Jewel Cave has a lot of draperies, soda straws and stalactites. With 30 people in our group this tour was the most crowded we have been on which made it harder to take pictures and hear the tour guide. We often felt rushed by the mass of people behind us pushing us along. But wait! The Day 2 fun is not over yet! After the cave tour we headed over to Crazy Horse. It had been years since they had seen it and wanted to seen what had changed in the past decade. We looked high and low for our friends Rudee and Phil who reportedly work there but this is the third visit in a row we have not been able to find them. We are starting to wonder if they even work there! Bob really enjoys this type of history so we walked each of the displays where he read many of the narratives while Barb, Deanne and I enjoyed just looking at the displays. Day 3 was our busiest day yet! We started out with another ATV ride but this time we trailered over to Kevin's and used that as our departure point. The terrain here was a little more rugged with more hills and rocks. The highlight of this adventure was the trip to the top of Cicero Peak which topped out at 6,168'. The views up there were incredible. I am not sure how far we could see but I am confident that we could see well into Wyoming and maybe even Nebraska. While up on Cicero Peak we saw a two track leading up to an adjacent peak. So down we went and up the next peak. It was rougher and rockier than any other trail that we had been on so we took it slow bouncing and crawling over rocks. All was going well and we eventually climbed to the top! We turned around to share the experience with Bob and Deanne but they were not there! We waited a minute but no Bob and Deanne. So we started back down the trail to find Deanne walking up the trail towards us. She explained that they were crawling over a rock when all of a sudden they broke a tie rod causing on wheel to turn right and the other to turn left. Hard to get up a hill when your wheels are pointed in different directions! Barb and Deanne walked to the top while I went down to see what we could do with their ATV. Bob, being a farmer extraordinaire is used to fixing things on the fly and promptly tied the tie rod back into place using a piece of baling wire and he was good to go and up to the top we went! We decided that we should probably not push it and headed back to Kevin's loaded the ATV's on the trailers and called it a day. But with all that dust and sun we worked up a huge thirst so we were off to Custer to visit the Mt. Rushmore Brewing Company! They had only been open 17 days but had 5 brews and a limited menu. Barb and I each got a flight while Bob taste tested a couple at the counter before deciding on a glass of the Summer Kolsch. What?!?! Bob with a beer? Bob and Deanne got the Smoked Salmon Pizza which they said they probably would not order again while Barb and I split the Fish and Chips which was pretty good. Overall they did not have any brews that we loved but it was a nice experience and we now have one more brewery crossed off our Black Hills Brewery Tour! Bellies full it was time for a road trip to see come more sights! We took the jeep on this adventure to take advantange of the open air and the fact that we were going to go through some narrow tunnels. Barb and Deanne thought it was easier to crawl in and out of the back of the jeep rather than using the doors. Interesting way to get into the Jeep! 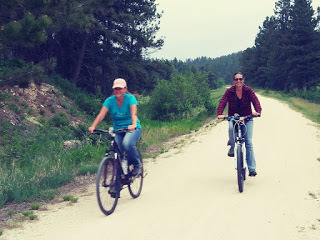 Our goal was to do a large loop from Custer, up the Needles Highway, travel past Mt. Rushmore and then taking the Iron Creek Highway back into Custer before finishing with the Wildlife Loop through the south end of the park. The rock formations through The Needles was incredible. It had been years since we have been through this area and both Barb and I totally forgot how beautiful it is! Although we saw several antelope and deer, for the first time we did not see any buffalo on the loop. The highlight of this portion of our adventure came when we rounded a corner to see about a dozen cars pulled over and 9 burros milling around getting handouts from the tourists. 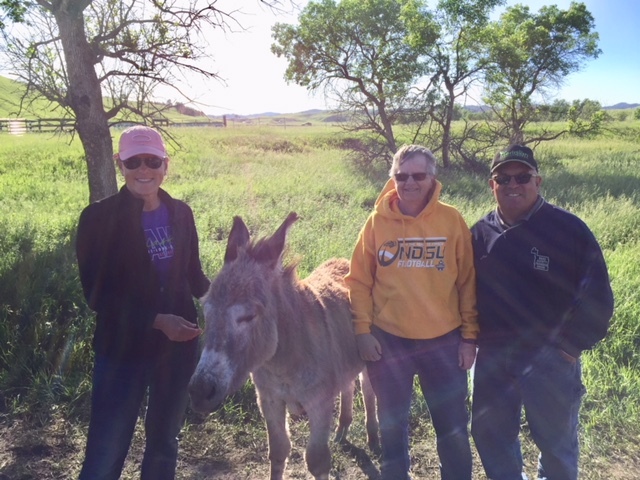 Barb had cut up an apple for just this occasion so we promptly jumped out of the Jeep to feed the burros. 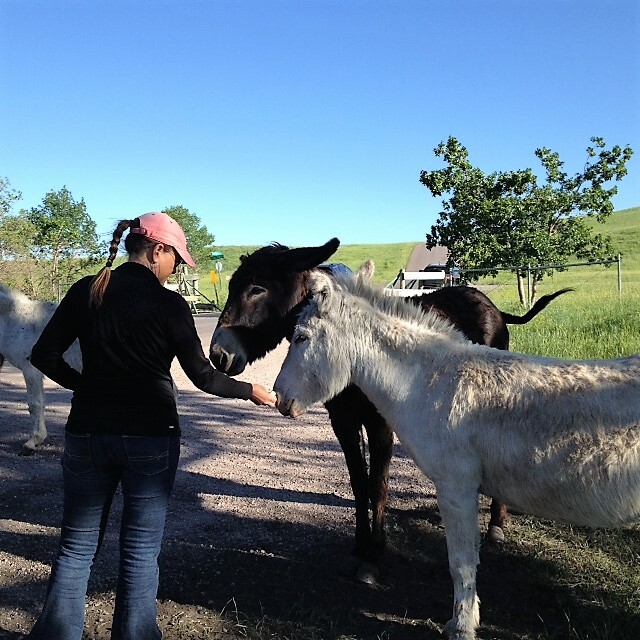 Several of the burros jumped at the chance from fresh apple treats and soon Barb was surrounded by several hungry critters. And for those of you wondering, the picture below is not another selfie, and no, that is not me standing between Barb and Deanne. No, I am not in this picture! Apples gone, the burros quickly dismissed us and moved on to other treat carrying tourists. We all got back in the Jeep and I started to pull back out into the road when there was a commotion behind me. I turned around to see that Deanne had only climbed 1/2 way into the Jeep and was just hanging onto the backend as I started down the road! I stopped so she could climb all the way in to see the car behind us laughing their @sses off at our debacle! Although it was a very busy three days, they went way too fast and before we knew it Bob and Deanne were packing up and heading home. It was great having them visit and we hope to see them again in a few months for our annual fall visit to the farm!